How many rock bands can you name where every member of the band has published an autobiography? Honestly, I'd like to know because I can't think of any other than my favorite band, The Police! 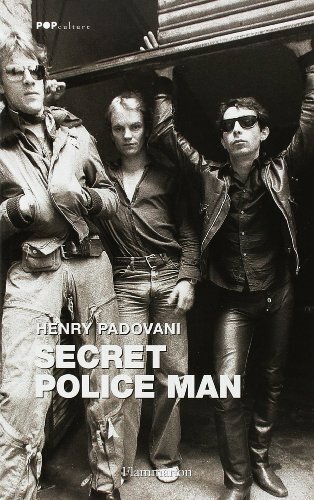 Between the years of 2003 and 2009, all four (yes four) members of The Police have released their autobiographies: Sting's "Broken Music" (2003), Andy Summers' "One Train Later" (2006), original guitarist Henry Padovani's "Secret Policeman" (French version 2006, English version 2009) and Stewart Copeland's "Strange Things Happen: A Life With The Police, Polo, And Pygmies" (2009). For a fan of The Police, these books are all essential reading, providing each band member's unique viewpoint on their successes, struggles, fame and often tumultuous relationships. If you haven't checked out these autobiographies yet, or are perhaps wondering which one offers the best place to start, read on as I'll provide my reviews of each band member's memoir below. 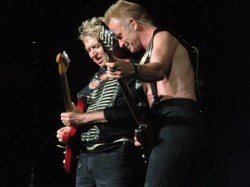 Photo above: Andy Summers and Sting of the Police, on stage August 2008. All photos on this page are by the author, sockii, unless provided by Amazon. Sting was the first member of The Police to release an autobiography in 2003 - the year in fact that The Police were inducted into the Rock and Roll Hall of Fame, played a short set at the ceremony, and rumors swirled that the band might reunite. Those rumors would not lead to anything serious for several more years. When I first read Broken Music upon its release, the book revealed a great deal to me why Sting and The Police were such an "odd fit" from the start and how it was only natural that eventually he would want to strike back out on his own path, pursuing other kinds of music which clearly were more dear to his heart. Broken Music does not devote a great deal of time to Sting's years with The Police. The book actually ends just as the band has flown to New York City for their very first gig in America at the legendary CBGB's. Instead, the focus of Broken Music is on Sting's early years: his sometimes tumultuous childhood, discovering music and struggling to juggle daytime jobs to pay the bills while playing with various jazz/fusion bands like The Phoenix Jazzmen and The Newcastle Big Band, and finally taking the chance to move to London with his then-wife Frances Tomelty to seek success. 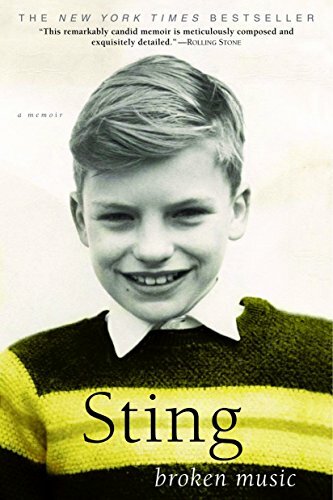 Whether you enjoy reading this memoir will depend a bit on whether you like Sting's music and personality in general. Broken Music can sometimes come across as overly wordy and pretentious, a bit cool and distant in tone, and clearly calculated to present a very specific image of its author. It reveals much about the events that shaped his life while also keeping a great deal very close to the chest. I would still strongly recommend this title to anyone who is at least a modest Sting and/or Police fan who wants to learn more about the early days and life of Gordon Sumner. 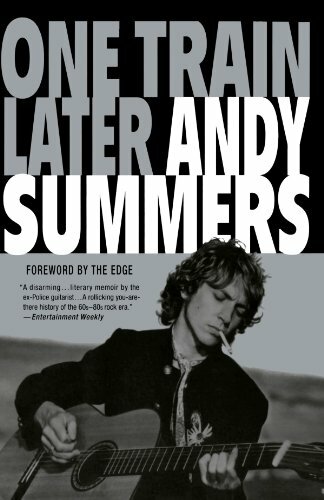 "One Train Later: A Memoir"
For those Police fans looking for the most detailed and personal take on the actual years of The Police's super-stardom, Andy Summers' One Train Later is the book you definitely don't want to miss. Andy frames his memoirs by setting the scene as the band gets ready to perform at Shea Stadium on August 18, 1983 - their biggest concert to date and yet also the moment when, at least to Andy, it seemed there was nowhere left for the band to go. From that starting point, Andy takes us back in time to his childhood, his early years playing with such artists as Zoot Money, Eric Burdon, Kevin Ayers and others before ending up in The Police as an already well-established session guitarist - and nearly a decade older than his bandmates to boot. Andy's writing style is a delight to read, infused with a dry British wit as well as a talent for capturing scenes, moods and moments in time. He is brutally honest with his own personal faults and failings, as well as the general atmosphere of excess and too much success that began to eat away at the entire band as The Police grew more and more successful. His stories of his pre-Police days in the wild 60s and early 70s are as equally fascinating, if not sometimes more so, to a Police fan who may know little about Andy's life before joining Sting and Stewart in the band. It is perhaps no wonder that One Train Later has since been given a documentary film adaptation, Can't Stand Losing You: Surviving The Police, which saw its world premiere in November 2012. But before you see the movie, I highly recommend reading the book first as it is rich in details and revelations which a shorter film cannot fully capture. Casual fans of The Police may not be well-versed in the full history and early days of the band, when it started as a somewhat different trio: Sting, Stewart and Corsican guitarist Henry Padovani. As detailed in both Sting and Andy's memoirs, Henry was perhaps the most "punk" of all members of the band, but Andy was the much more polished and practiced guitarist at the time he first crossed paths with The Police. Sting felt he could start writing more complex songs with Andy involved and for a very brief time they functioned as a four-piece band, but soon enough Henry was asked to leave and The Police became the world-famous trio we know today. But what happened to Henry after that? He actually went on to have a successful career in the music industry himself, performing with other punk/new wave artists such as Wayne County & The Electric Chairs, forming his own band The Flying Padovanis, and then working for IRS Records International Division in the 1980s. Henry tells his story - from his early childhood days on through working with numerous international stars - in this autobiography, first published in French in 2006 and then in English in 2009.The English edition includes a new final section on reuniting with his former bandmates in The Police for an appearance during their 2007-2008 reunion tour. It's interesting to get Henry's point of view at last on those early Police days, what lead him to the punk scene in England at the time and how he moved on to create a successful career after that point. However, it's difficult for me to give this book a fully glowing recommendation or review as it could have used much better editing - and most definitely a grammatical/formatting review, especially the English edition. The frequent punctuation errors and inconsistencies both in formatting and facts make it often difficult to read - which is a shame because there's a great story here to tell if you can get through it all. Read my longer, complete review of Secret Police Man for more information on this title. 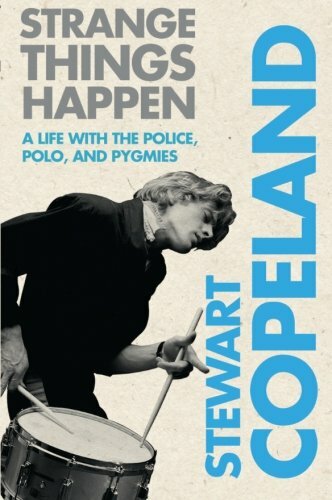 "Strange Things Happen: A Life with The Police, Polo, and Pygmies"
Stewart Copeland had, for many years, delighted his fans by sharing numerous "Dinner Tales" on his website. From composing for Angelica Houston to being a judge for a BBC "reality show" competition, these stories gave fans insight into Stewart's post-Police life and adventures. They would also become some of the building blocks of his 2009 memoir Strange Things Happen: A Life with The Police, Polo, and Pygmies. Strange Things Happen... skips almost entirely over The Police years of 1977 - 1983, which Stewart covered (to his own satisfaction, at least) in his film documentary Everyone Stares: The Police Inside Out. This book instead focuses first briefly on his pre-Police years but much more on his many experiences after that such as filming The Rhythmatist in the Congo, composing his first opera, playing polo against Prince Charles and rocking out with the Foo Fighters. It's a bit disjointed and those looking for tell-art dirt and gossip will certainly be disappointed. 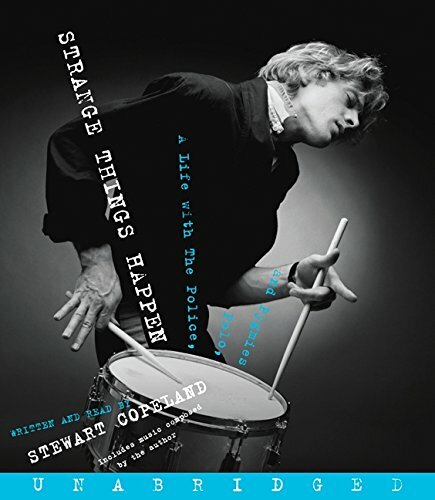 However, for those who are fans of and know Stewart's style, it's a delightful romp through the drummer/composer's life and times.Stewart's book is also the one Police autobiography to cover the 2007-2008 Reunion Tour in detail, and to this fan that is where the book really shines. Stewart gives us a glimpse inside the difficulties of the band trying to get back to where they once were after many years apart - and going off in increasingly different directions musically. There are humorous incidents as well as telling ones, not just about what it means to be a member of The Police but how Stewart views his role in the band, performing for the fans and giving them what they want, and finding creative expression, inspiration and satisfaction in other ways. I actually recommend the audiobook version of Strange Things Happen even moreso than the print version. Narrated by Stewart himself, he really brings these stories and humorous adventures to life. Stewart's own music adds atmosphere and background to many of the stories, making it a wonderful experience for the fan to enjoy. Three out of four ain't bad...maybe someday I'll get Sting, too! Which one was your favorite book? The Police on stage, July 2008. Andy Summers' "One Train Later"
Stewart Copeland's "Strange Things Happen"
Henry Padovani's "Secret Police Man"
I haven't read any/all of them yet so I can't say. Well, the Police reunion tour was really a once in a lifetime event. I was just a little too young/too late to see them in the 1980s, so when they did the reunion tour I simply had to make the most of it knowing the chance would likely never come around again. I did see Depeche Mode for the first time about a year ago, whenever their last tour was? And they put on a great performance. Believe it or not, an old Nikon coolpix digital camera, not a fancy DSLR camera (like I have now for other types of photography). I found it's great for concert photos in certain lighting conditions and if you are close enough; it was also good because I could can it around in my purse and never had issues with security like you might with a larger camera. :) It's nice that you're their contemporary. Of all the bands I really like, only Depeche Mode still tours. And yes, I've been tempted to see them perform elsewhere as well. I can't wait for them to tour again. Great article and the photographs are fantastic! What kind of camera were you using?